I get asked a lot which brands of bread qualify as clean eating bread. In a perfect world, we would all have time to bake our own bread from scratch. But in reality, most of us buy it. We are a society of convenience and few things are more convenient than purchasing your daily bread. But over the years, bread has changed. What used to come from a local bakery now comes from a huge food corporation and the ingredients are enough to make you raise not only one eyebrow, but two. It’s frustrating to walk through the bread aisle, reading bread label after bread label only to find that there may only be one loaf that is actually clean, if any at all. Add to that the fact that wheat is a huge issue for so many people (thanks to hybridization of our wheat crops), and you’ve got yourself a recipe for hours of label reading and still coming up empty handed. So I thought I would do some of the hard work for you. Oddly enough, it has never bothered me to spend time reading nutrition labels and I’ve gotten pretty good at scanning them in under a few seconds. Here are the brands that I have found to be clean. These are all wheat/spelt based and they do contain gluten. I’m still on the hunt for a clean, gluten free bread. And remember, if you can’t find these locally, you can always buy online. There’s nothing quite like home delivery! Berlin Natural Bakery Bread – This stuff is incredible. The slices are on the smaller side (I think that’s a good thing!) and their sourdough is fantastic. And only 3 ingredients! (Whole Grain Spelt flour, water, sea salt.) Found mine in the freezer section. They have other varieties of bread, but I have not checked yet to be sure they are clean. Click here to see where they sell in your area. Whole Grain Natural Bread Company (Beckmann’s) – I found this at Whole Foods, but you can also order it directly from the bakery online. Ingredients: 100% freshly stone ground whole wheat berries, water, honey, yeast, sea salt. Click here to order from their web site or to contact them about where they sell. 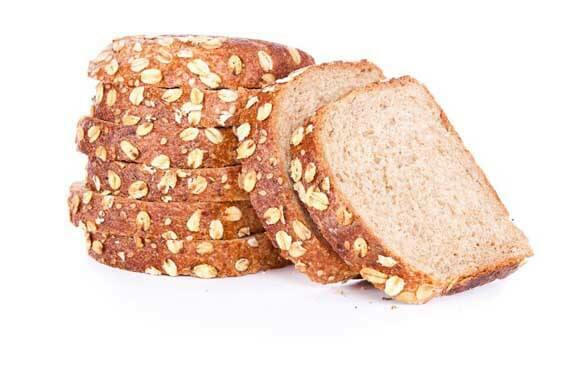 Food For Life Ezekiel Bread, Sprouted Whole Grain – This bread is most often found in the freezer section. Ingredients: Organic Sprouted Wheat, Organic Sprouted Barley, Organic Sprouted Millet, Organic Malted Barley, Organic Sprouted Lentils, Organic Sprouted Soybeans, Organic Sprouted Spelt, Filtered Water, Fresh Yeast, Organic Wheat Gluten, Sea Salt. While I don’t use this bread, I see it most often at Whole Foods. And yes, this contains soy, which I’m aware many people avoid. But not everyone does, so I included it here. Click here for their store locator to find where they sell in your area. Need recipes for making clean eating bread at home? If you find you do have to bake your own bread at home, not to worry. I’ve got you covered there too! Click here for all my clean bread recipes. I buy Ezekial Cinnamon Raisin and there is no soy in the ingredients. Could you explain why people avoid soy? Is it not healthy? Heather – The American supply of soy is far from healthy. There is a lot of evidence that shows that soy messes with hormone levels. But aside from that, most soy is a GMO in the states. That being said, if it’s organic soy, it SHOULD still be okay. But really, the only healthy way to eat soy is when it’s organic AND fermented. Not something we really find a lot here in the states. I’m glad Ezekiel made the list, it’s what I’ve been using the last year. And I only use 1slice per meal as that is 1serving! I don’t get that bloated stomach feeling after I eat it, could that mean I’m sensitive to gluten and why I get that feeling with regular bread? Sorry for another question! Love this blog site! Heather – It’s possible, but I would have no way of knowing. I believe Ezekiel bread still has gluten though. Could be you just have an easier time digesting the sprouted grains. Shelley – You’re right. Our food supply is in pretty sad shape. Something we need to address with our law makers and with the power of our purchases. I am fortunate in that I love to bake my own bread so I can make it clean. I do not react to gluten, nor do I believe it to necessarily be the Devils playground it’s made out to be. However, I still bake with organic, GMO free locally sourced grain and all organic ingredients. It takes a long time to make but not to assemble or bake. I don’t even have a full oven and I bake two large loaves a week. I just assemble the ingredients accept 1 cup fresh milled hard wheat and the yeast, mix the other stuff well, let it sit for 8-24 hours autolysing and then finish it with a bread maker. I have Food for life “7 Sprouted Grains” in the freezer. I just double checked the ingrefiant list…no soy. Tiffany thank you for sharing your knowledge and clean recipes with us! While having radiation therapy for breast cancer, I met with a nutritionist recommended by Sloan Kettering and was advised that I should not consume any type of soy products. It is difficult find a bread that I can eat. Phyllis – The Berlin Naturals Sourdough has no soy at all. Worth a look! I buy Udi (Costoc) or Rudi (Kroger) breads are these breads clean? I know they state they are gluten free but does that also mean they are clean? Patty – No, gluten free does not mean they are clean. Neither does the term organic. I’m not sure which specific loaf you buy, but I have not found any breads from Udi to be clean. Not the loaves I’ve seen anyway. Thanks for posting about this!!! I was just thinking about this as we take baby steps to removing all GMO’s from our home. THANK YOU!!! Tiffany I went to the websites and it looks as though Ezekiel is the only one made of sprouted grains. Is that what you found also? Nan – I believe so, yes. Thanks for the list! Would the ‘Berlin Natural’ Spelt Burger Buns also qualify as clean? Ingredients: Whole Grain Spelt flour, water, expeller pressed canola oil, honey, yeast, sea salt. The only thing I’m not sure about is the expeller pressed canola oil. Can you please explain that to me? Christina – As far as I know, unless it says GMO-free, canola oil is a GMO and is very processed as well. Do you have any recipes that are clean? I’d be interested in trying to bake my own! Hi – I want to start eating clean, or at least cleaner, and love Dave’s Killer Bread. It appears that they fit the clean-bill-of-health but since I’m a newbie, I wanted to see what you thought. Hi, Could you argue that no bread is clean? Bread afterall doesn’t grow itself and requires a lot of processing? Jon – Not really. It’s just baked in the oven. The important thing is the ingredients. Now THOSE can be very processed if you’re not careful. But the act of actually making the bread is not “un-clean”. Linda – Do you mean my recipes on this blog? Beckman’s bread. Price is good 4.70. Cheapest shipping option: $30.88. What the what??? Jill – For one loaf of bread?? I find that hard to believe. I would contact them and ask . It could be a mistake. Also maybe call around and see if any stores in your area carry that brand. I looked at the link in the article and they don’t carry it around me, that’s why I went to the site. That was the cheapest option. It went up to over $70. I will call and see if it is a mistake. Jill – Please let me know what they say! That seems a little steep, even by today’s standards! Nope! Not a mistake. If you are on the east coast that charge is it. oh well. Jill – OMG!!! That’s awful!!! For 1 loaf of bread?? Jill – In this case, ya. Ouch!! I will have to see what I can do about that for my own bakery. Yikes!